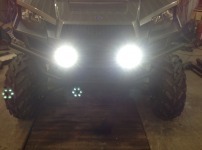 We are getting a lot of UTVs in of all makes to get better lighting. Our Xtreme Off-Road LED lighting is a great way to get super bright, super dependable lighting on almost any application. 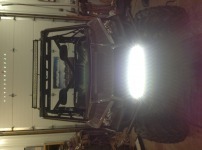 Here is our 42" Double Row LED light bar lit and burning eyeballs! 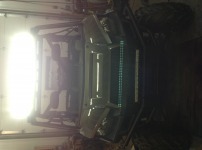 Here is our Round Post Mount LEDs on the push bar area and turned on! This what the pair of 5" 42 watt LEDs look like. These are post mount for easy mounting! 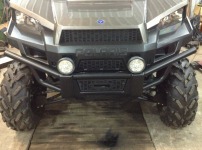 We tried a 10" single row LED light bar on the front also!